Given February’s volatility, we took the opportunity to update mid-month. Now in early March the space traveler who left earth on 31 January and returned on 28 February may wonder what all the panic was about. The US 10 year bond increased in yield (lower price) by 16 bps to end at 2.86%. This is close to the level it spiked to after the 3 February release of wage data which showed some growth. The S&P 500 recovered from lows to have a month on month performance of – 3.89% after falling to a closing level of -8.6% from the 31 January close. (Apologies to readers as I do not normally discuss asset classes other than the bond market). The Australian bond market responded to the view that the RBA is on a different path (on hold) than the US Federal Reserve (increasing rates). The 10-year Australian government bond finished unchanged in yield at 2.81%. 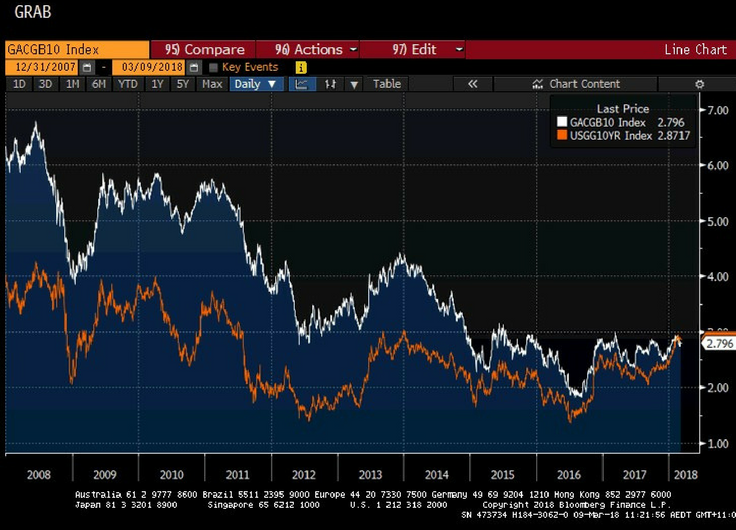 The 10-year Australian government bond yield is now below the 10 year US government bond yield. The 3 year Australian government bond yield fell (price higher) by 6 bps to 2.09%, with the data during the month supporting the view that the RBA is on hold for at least all of 2018. Please note that this is in the context of the 3 year US government bond’s rising yield (falling prices) by 12 bps to 2.41% now 32 bps above the Australian equivalent. Credit spreads, or the premium required to hold a corporate bond instead of a government bond, spiked higher but have generally returned to levels slightly above those seen at the end of January. The Bloomberg AusBond Composite Index (the common benchmark) for all maturities produced a positive return of 0.29% for the month. The Treasury Index (government bonds) for all maturities which is the single largest contributor to the Composite Index, produced a positive 0.27% return. The Credit Index (corporate bonds) for all maturities produced a positive return of 0.36%. Corporate bond indices up to 10 years out performed their government bond equivalents (except for the 3-5 year sector).